The islands of Samoa offer stunning natural scenery, unique and unforgettable experiences and a welcoming culture that celebrates the fascinating traditions of ‘fa’a Samoa’, or ‘the Samoan way’. Family, ancestry and tradition come first. Strict religious traditions such as set prayer hours and everything closing on Sundays may require some adjustments for visitors, but they will be richly rewarded by getting to know the wonderful people of these islands. The country of Samoa is comprised of the two large islands Savai’i and Upolu as well as eight small islets. Savai’i is the larger of the two islands. It is less populated and less developed. The year 1911 saw the last volcanic activity on the island. The eruption of Mt. Matavanu started in 1905 and left 30 square miles covered in lava. Mt. Silisili, however, is the highest peak in the mountain range that runs across the island. Reaching a height of 6,100 feet, it is surrounded by rainforest and covered in clouds. It takes two days to hike and explore the mountain on a guided tour. The port town of Saleologa is the likely arrival point on the island with ferry service to and from Upolu. There is also an airport and a lively market offering crafts, clothes, produce and people watching. On the island of Savai’i one will encounter unspoiled traditional villages, with churches and open thatched structures called fale surrounding the village green. Visitors are welcomed at church services, which is a good way to get to know and interact with the people and learn about the ‘Samoan way’. The island is encircled by a well paved road which provides easy access to the many beaches and lagoons as well as some truly stunning tropical scenery. Highlights of Savai’i include the Sale’aula lava fields, which were a result of the 1905 eruption and the Alofaaga blow holes, which are a network of lava tubes located outside the village of Taga. 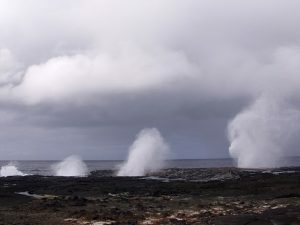 As the waves crash on the rocks, pressure builds up causing geysers of over 100 feet accompanied by a thundering roar. Locals enjoy placing coconuts in the holes, creating a cannonball effect, but getting too close to the holes is definitely not safe. Dwarf’s Cave is also a lava tube, which can be explored with a guide, a torch, and some good shoes. Said to be inhabited by dwarfs, this cave is over a kilometer long and can take as long as a whole day to explore. 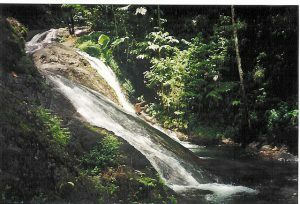 The Falealupo Rainforest Reserve is located in the northwest part of the island. Regarded as a modern day Garden of Eden, it features a canopy walk built 130 feet above ground among giant Banyan trees. Cape Mulinu’u is the country’s westernmost point and was previously the last place on earth to see the sunset before Samoa jumped over the dateline. This beautiful spot has a swimming hole, cave and an ancient star mound. Not far from here is the Auala Green Turtle Conservation, one of the largest in the world, where you can swim with turtles. The Afu Aau Falls, one of the many beautiful hidden waterfalls located throughout Samoa, is a great place to cool off in a sparkling pool and is located next to the Tia Seu mound (also called the Pulemelei mound), which is an ancient stone pyramid constructed as long ago as 1400 AD. Built out of volcanic stones, the mound is considered the largest and oldest structure in Polynesia. 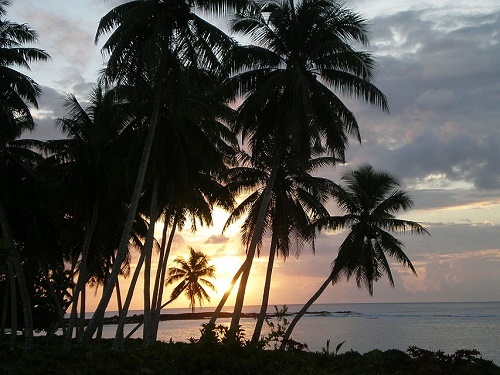 The most populated of the two main islands is the 47 mile long island of Upolu. 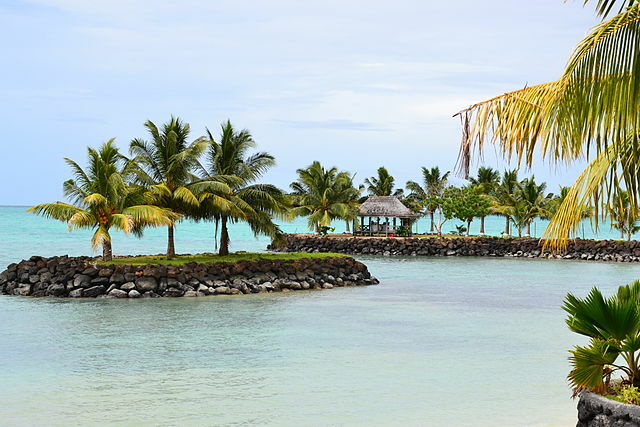 Aside from being the location of the capital and most important city Apia, the island features lush, troical scenery, spectacular waterfalls and fine, quiet white sand beaches. Apia harbor is located at the mouth of a river in a beautiful natural setting on the north side of the island. 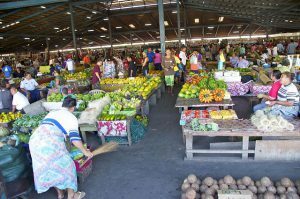 The modern city of Apia now surrounds and sprawls outward from the original old village and has grown to a population of just under 40,000 people. A fun and interesting way to experience village life and the ‘Samoan way’, is to visit the Samoa Cultural Village in Apia. 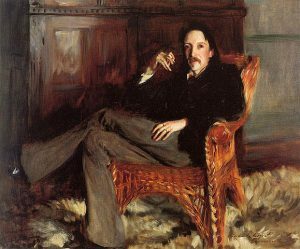 A visit to the last home of Scottish writer Robert Louis Stevenson is a must when visiting Apia. The Stevenson Museum contains interesting memorabilia and the house, which was called ‘Five Waters’ because of the streams crossing the property, had five bedrooms, a library and a large ballroom as well as the only fireplace in Samoa. A one hour hike up the hill takes you to the grave site of the author and his wife Fanny. The steep path to the grave is known as the ‘Road of Loving Hearts’. The Immaculate Conception of Mary Cathedral was rebuilt in 2014 after structural damage from the earthquake of 2009 necessitated tearing it down. The cathedral features amazing stain glass windows and beautifully carved wooden ceilings. 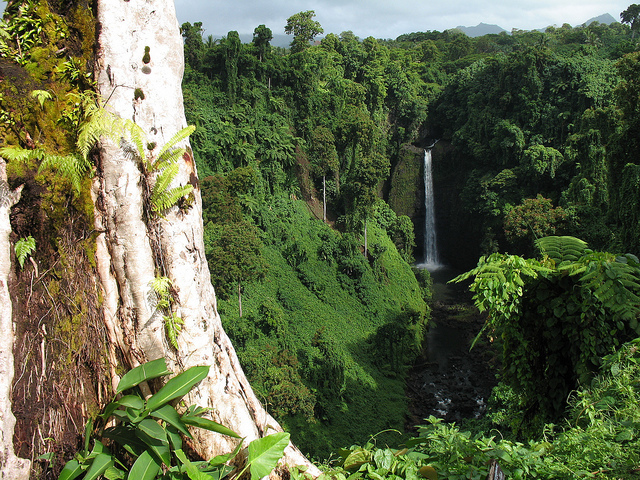 Upolu is graced with easily accessible beaches and quite a selection of spectacular and unusual waterfalls. Relax in one of the small thatched fales, or swim in the clear waters at Tafa Tafa or Lefaga beaches. Visit the Papapapaita Falls which plunge 500 feet into a crater or experience the Papaseea sliding rocks which are essentially a natural 16 foot waterslide. 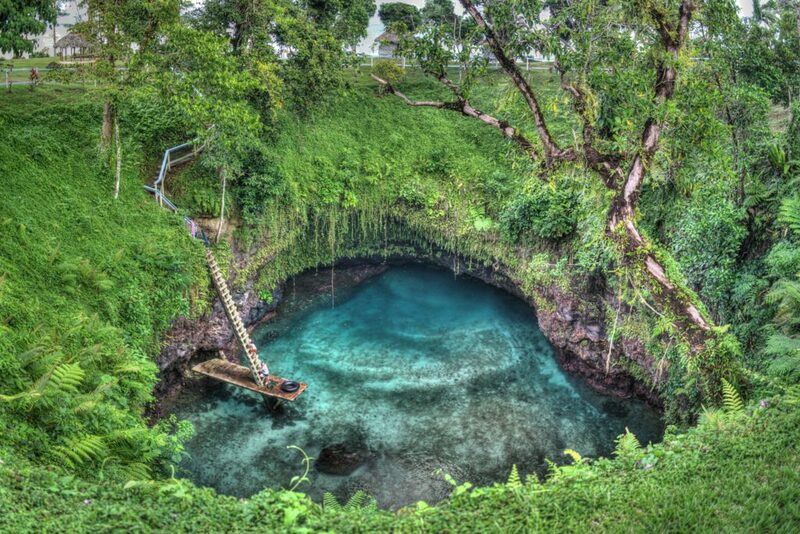 The To Sua Ocean Trench has been called one of the most magical swimming pools in the world. To Sua means ‘giant swimming hole’. It is a clear pool of water populated by tropical fish that is 100 feet below ground, surrounded by lush vegetation and accessed by a steep wooden ladder. It is connected to the ocean by lava tubes and experienced swimmers can even swim through the tunnel to the ocean. Other activities include canoe tours through the mangrove forests, swimming or snorkeling out to the Giant Clam Sanctuary, where there are clams up to a meter large in size, or as large as coffee tables. 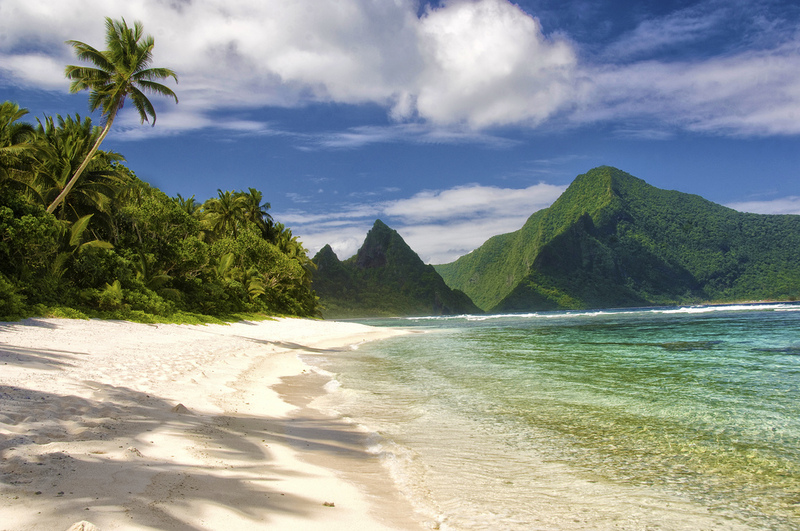 The islands of American Samoa contain some of the most amazing scenery in the South Pacific. 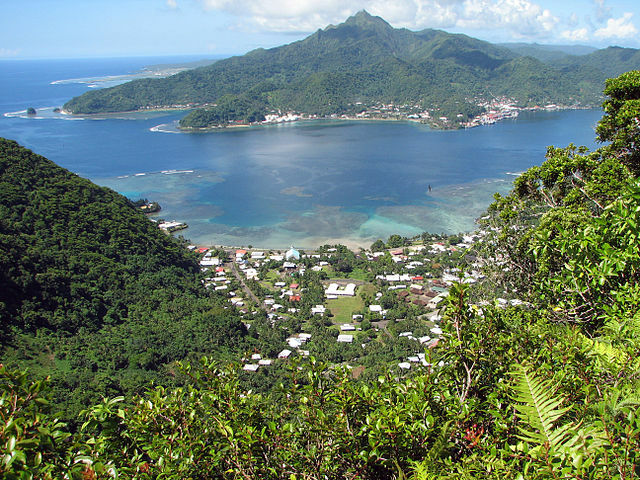 Tutuila is the largest and most populated of the islands and the location of the capital Pago Pago. The large harbor is surrounded by intensely green volcanic peaks including Rainmaker Mountain which rises to 1,716 feet. 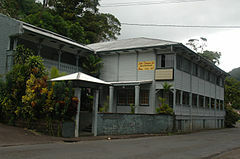 Pago Pago’s attractions include the Zion Church built in 1900 which features a beautiful carved ceiling, the Atauloma Girls School, also established in 1900 and abandoned in 1970. It is said to be very haunted and was featured on Ghost Hunters International and the Sadie Thompson Inn. Sadie Thompson was the prostitute described in the story Rain by W. Somerset Maugham. Maugham stayed at the inn for six weeks while traveling through the South Pacific and it is the setting of his story which was adapted for film three times. 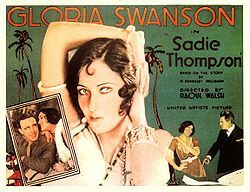 Gloria Swanson, Joan Crawford and Rita Hayworth all portrayed the character who is thought to have been a real person who had been cast out of the red light district of Honolulu. The Jean P. Haydon Museum is worth a visit for informative exhibits showcasing the history, culture and nature of the islands. Tisa’s Barefoot Bar, also in Pago Pago is a favorite destination for many who visit. The views, seafood and drinks promise an unforgettable experience. There are five islands and two atolls in American Samoa. Swains Island, which became part of American Samoa in 1925, is not actually considered part of the Samoan Islands. It is located in the Tokelau chain to which it has cultural ties. It is often referred to as Olosenga or Olohega Island. The population was only 37 as of 2005 and it is still owned by the Jennings family whose patriarch Eli Hutchinson Jennings purchased it in 1856 for 15 shillings an acre and a bottle of gin. 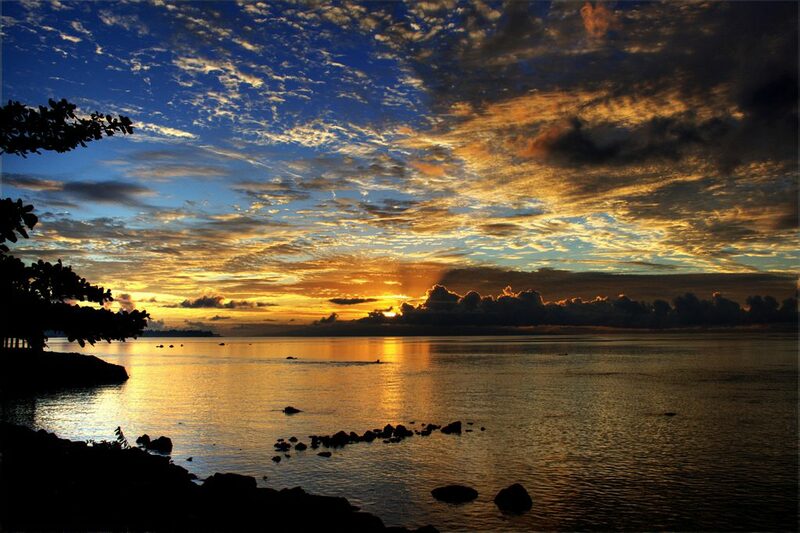 The National Park of American Samoa spreads over the islands of Tutuila, Ofu and Ta’u. The tropical scenery, coastline and wildlife accessed by the scenic drives and numerous hiking trails are nothing short of spectacular. Other highlights of the islands include Faga’alu Waterfall and the quadruple cascading Laufuti Falls, the Tau Coral Colony, which, at 800 years old, is thought to be the oldest reef-forming coral colony in the world and Vailulu’u Eel City, where a submerged volcano with hydrothermal vents is inhabited by a large colony of eels. Although secluded, the pink sand and serene beauty of Ofu Beach make it one of the most stunning beaches in the world. Petroglyphs and various archeological sites dating back 3,000 years add to the long list of attractions to be found in this territory which, in total, is only about the size of Washington, D.C.